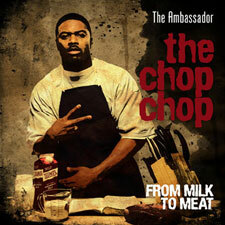 On September 23, 2008, Ambassador will release his 3rd solo album, The Chop Chop : From Milk to Meat. His focus is to challenge the believer to go on to maturity in their faith as the author of Hebrews exhorted in Hebrews 6:1-3. But let me back up a few years. . .
After listening to House of Representatives I remember being completely blown away. I was literally at a loss of words because of the way doctrine was didactically communicated in rhyme form without the arrogance commonly associated with hip hop. In addition to the spiritual nutrition of the lyrics, this album was relevant sonically and culturally. The more I carefully listened to this album, I began noticing the comprehensiveness of the Christian faith. A worldview was being communicated in my tongue. Not only did this album boldly claim the historic Christian truths, but it did so in a very reasonable way. By reasonable I mean it was logical. It also forced the listener to put his/her thinking caps on if they were unfamiliar with the humanistic, cosmological and ontological arguments addressed in Superstars. Naturally, I wanted to know more about these urban theologians, so I read the CD insert and discovered they had some contact information. So, I decided to e-mail them just to let them know how much of a blessing they were to this young convert. I didn’t say much, but whatever I said must’ve resonated with them. I remember getting an e-mail first from The Tonic and then from The Ambassador. They basically thanked me for supporting their ministry and being a blessing. I was amazed that they took the time to respond. As I peeped your shoutout on our site, I was blessed to see how you are moved by theocentricity (God-centered-ness). We have a common bond here because that is my steelo as well. I too get rocked off of “I Love You Jesus” and I wanted God to use the song this way. You have blessed my soul. I just wanted to acknowledge you and thank you for testifying. We need that. You continue to pour out honor and glory to our worthy Savior. Jesus Christ can not get enough of our praise, especially since that is not the popular thing today among the hip hop type. So continue my friend in the most holy faith, and you will not fail to receive you crown which you will be able to cast a His feet on that Day when we shower Him with our rewards. It is all His grace and power anyway. A few months later, I would eventually meet Ambassador when Crossmovement came to Austin, TX in the spring of 2000. But this story is worth sharing because this is when I saw their faith in a practical way. Before the concert, they were doing a cd/poster signing at a local Christian bookstore and I decided to go just to get a chance to tell them again how blessed I was by their music. I said, “I know who you are.” He kinda laughed embarrassingly. Phanatik said, “Yeah, Yeah! What’s up brother!” and he came over and gave me a pound. There was a nice tray of edibles for the artists, but I really wasn’t fond of carrots and celery sticks. I was buggin’ because they knew who I was or at least remembered some posts on their message board that I wrote. Later, I realized it was just the joy of the Lord present when there’s fellowship of the Spirit. Over the years, we’ve kept in touch and I’ve been to Philadelphia a couple of times to visit him and his family and his church, Epiphany Fellowship. Honestly, what blesses me the most is seeing “the man behind the music”. I know that sounds cliché, but to know someone you admire and see the evidence of God’s grace working in his and his family’s lives, is a blessing. Having spent a few days with him, his immediate family and his church family, showed me his passionate pursuit of God as well as his undone-ness. More than the music, he’s passionate about being a godly husband and father and it is evident by how his family responds to him. The Chop Chop : From Milk to Meat is another tool in God’s unfolding redemptive plan to reach His sheep within the hip-hop fold. No doubt The Chop Chop will be to someone what House of Representatives was to me nine years ago. What I love about this whole situation is that it reveals how God intricately loves and is concerned with His children. The Lord used and continues to use Ambassador to help me (and many, many others) see past religiosity or churchianity, and see Christianity exhibited in an urban context, my context. I used to wrestle with ideas of what a Christian should look like and act like based on some of the cultural and religious trappings I’d been exposed to growing up. I was completely blind to the beauty of the diversity of His plan. I should’ve at least taken notes from creation itself, right? As the Grand Weaver in this tapestry, He is intricately designing a beautiful diverse masterpiece which we will one day rejoice in and be part of. But even in the complexity and variance of the details of His process, there is joy upon joy as we take notice of His outworkings. Have you noticed? Are you noticing?